Tattoos | Life Is Absurd. Don't Fight It. I am glad that I had the foresight to prefix all of these claims to fame with the word “dubious”, because some of them are really very tenuous indeed. I could have alternatively titled them Brief Encounters With Celebrity, because there is generally a little bit of substance to them rather than merely being in the same room as someone (in which case every single music or comedy gig could be included). I’m still striving too to include only tales that have occurred as a lay person, and not in the course of my one-time day job working in film and theatre. This is the time I met comedian Ross Noble. I had been to one of his gigs at Glasgow’s Kings Theatre, sometime between 2004 and 2007. I know these dates to be correct, as I was living nearby in Charing Cross at the time, but can’t be more specific as I’ve seen him four or five times now. I left the theatre and went home, took my ticket stub out my wallet and put it in the box with my other stubs, and then decided to nip back out to get some food. My journey took me past the Kings, and I saw Noble standing at the stage door surrounded by a handful of fans and autograph hunters. I’m generally averse to being part of that gaggle, and continued on my way. I bought a sandwich from an international chain that makes them to order, and returned by the same route. When I glanced over again, I recognised one of the girls from the first year of my degree course. In fact, since I must have been in third year then, that would probably put this as sometime in 2006. 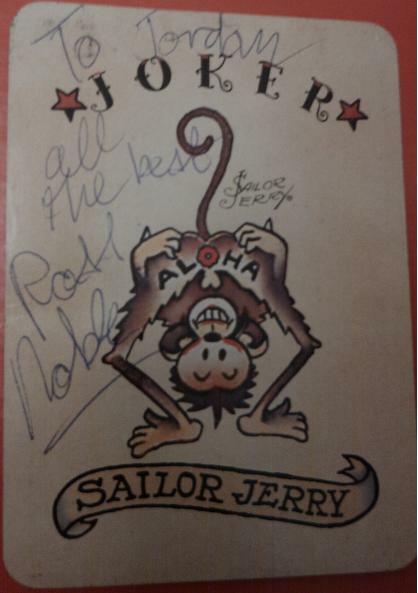 It dawned on me that I did have something in my wallet that would look good with his signature across it – the joker from a deck of Sailor Jerry playing cards. When that brand of rum was launched, they put out loads of promotional items – lots of temporary tattoos, decks of cards – and I had taken the joker from a pack of cards my friend had. She was working in a pub at the time, and they had dozens of items left over. The joker showed a very cheeky monkey, bent over and spreading its arse cheeks. The buttocks read “AL” and “HA” and the positioning and the action made it read “Aloha”. I thought it was quite amusing in a puerile way, and had liberated a few rub-on tattoos showing it (some of which I think I still have, unused), and stuck that card in my wallet to show/disgust people. Noble has long documented his obsession with monkeys, on almost every tour and DVD he has done, and so it seemed fitting to offer this card for him to autograph. He looked at it, shrugged, and signed it for me. It makes a different souvenir, and a better story, than just having a signed ticket stub – anybody can get one of those. Tattoos That Stay With You. I asked him why he had chosen to get his own name inked on him, and why he hadn’t had it done in Chinese or some other less-obvious language or style. He told me that “then no-one would know what it says,” as if I was an idiot for not thinking of that. Perhaps he was so forgetful that it posed problems, and his solution was a permanent reminder of his own first name written in an easy-to-read location. I did eventually find out the reason for the dots, quite by chance. It was my birthday night out, some years later, and I was drinking with the former Scenic Artist from that venue. He explained that he had designed the tattoo, writing it out in an artistically-pleasing font. When he finished, he habitually did his trademark run-off, and trailed it out in a series of dots. He demonstrated this on a tattoo of his own, a star, where all the points ended with a row of dots. Scott had got those tattooed too.